It's a dreary, drizzly Saturday. Kepi just lighted the fireplace, and I could hear wood crackling as the fire devours the pile. Today, I'm enjoying the company of Kepi, Daisy and Dizzy. I treasure days like this - quiet and relaxing. Yesterday was a different story. 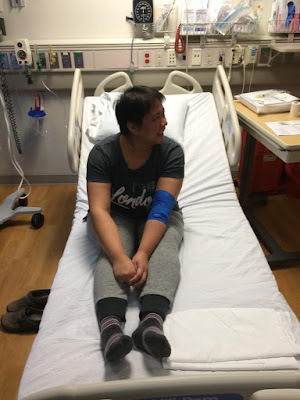 It was a day of medical tests and the ever dreadful bone-marrow biopsy. What really surprised me (and made me emotional) was that they've started performing the biopsies at the floor where I got my ATG and chemo treatment. The walls were like pages in a diary. Every minute I was there, the memories of my bone-marrow transplant flooded my emotions. It was those same walls that witnessed the most terrifying, painful and challenging days of my life. Yesterday, the same walls welcomed me back and recognized that I am still fighting and standing. Because life is always worth fighting for. Tears poured after my biopsy. Chatting with the nurses and technician before my bone-marrow biopsy. Sending you prayers and lotsa warm hugs! What a moving story. Keep on fighting! I will. Thank you for the encouragement. I am so sorry that your bone-marrow biopsy was so stressful for you. It is stressful in itself already but having to re-visit the places with such powerful memories must be really difficult. You are a fighter and you are very very inspiring! I'm sending you lots of hugs and I hope you'll be able to relax today and leave the memories behind so you can feel better. Hi Beate, Thank you for visiting and I really appreciate the encouragement and support. Be strong. You are still standing and I am sure that there are wonderful things ahead of you. Will do, Loree. I am looking forward to more wonderful things. Thank you, edelweiza. I will keep fighting and appreciating life. Thank you, Indah! I am doing much better now.